Cold Calc MDA is designed to clearly and simply input the minimum required fields (Elevation, Charted MDA and the reported temperature) to obtain a temperature corrected MDA. 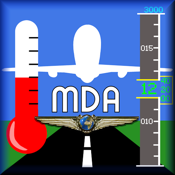 Once these three variables have been entered simply touch the background to dismiss the keyboard and your results are immediately calculated for you and your HAA ( Height Above Aerodrome ) and corrected MDA are clearly displayed. -Either Elevation and/or MDA being omitted etc. The temperature is input via a slider making it easy to modify the reported temperature without having to type in numbers via a keyboard. These modifications are always displayed in real time. Once you have set-up your parameters and corrected your MDA the app can be turned off. Should a change occur at your destination airport, turning the app back on will reveal all the previous entered data so only the changes required to be made require entry. As you approach the field, the controller advises that the Glide Slope is u/s and the approach has now changed to a "Localizer Only" approach ! You pull out "Cold Calc MDA" app and the only change you require is the "LOC ONLY" charted MDA. You now enter the Loc Only MDA and your new Corrected MDA is immediately displayed in bold large easy to read digits. I designed and coded this app to alleviate the cumbersome and time consuming error prone charts we currently access to obtain the identical results. I always get my First Officer to perform that task manually via the approved charts as this app should be used as a reference only ! I hope you find it useful. It will reduce your workload and prevent common chart "look-up" errors as well as interpolation inaccuracies. I look forward to receiving your comments and suggestions. Bravo! (v1.0) Quick, simple to use, precise. Rapide, facile à utiliser, précis. Very Clean non-cluttered interface. Large digits. No confusion. Very Nice. This is extremely handy! Simple, but effective with a nice intuitive interface. Great job! Quick, simple and easy to use...saves the squinting at charts and mental math on a cold dark approach. "ColdCalcMDA" is by far "Best in Class". Simple to use, accurate and non distracting. Perfect for the IFR pilot operating in cold weather. Nifty, accurate and quick. A great operational reference tool for all IFR pilots operating in winter conditions.